As we near the end of another LONG A to Z Challenge, I figured we could all use a little calming influence. Book Drive Update: The goal is 500 books (or monetary equivalent) for teenagers during the month of April. So far, we've received 14 books and $105. ... uh ... this number hasn't budged in the last two weeks! YIKES! PLEASE HELP US OUT and donate a book or a buck for this worthwhile cause. The donate button is on the blog's right side bar, and you can find complete details by CLICKING HERE! Xanax is a great X word. The first three weeks flew by. These last few letters are killing me. Bravo for getting this far. Hopefully without the Xanax! 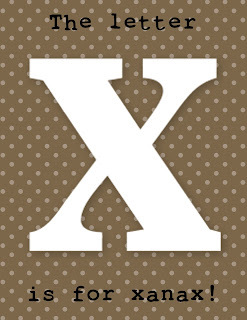 Hey - a new X word. I've visited a bunch of A to Z posts this morning and seeing a lot of repeat. Kudos for coming up with a new one. I applaud your book drive for teens but I'm already supporting one closer to home. I wish you luck on yours. I just took two big boxes of book down to my library for donation. I'm thinking of a nice red wine or single-malt scotch, very similar to Xanax but tastes better ;-) If you get a minute, visit my blog at www.dianeweidenbenner.com Happy blogging! Hi Margo, interesting post for the letter X.